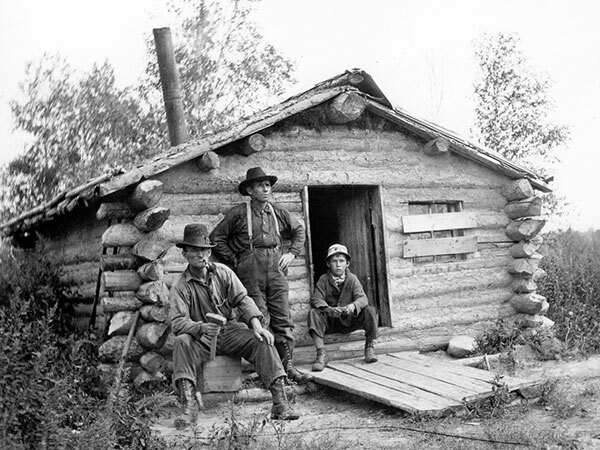 The cabin of Billy Baker and Tom Patton at Baker’s Narrows. Outside of the densely populated urban and agricultural southern region, Manitoba seems to most people to be one huge “wilderness” area—the land of 100,000 lakes, the home of polar bears, and a wild tangle of pre-Cambrian rock, dense forest and sub-arctic tundra. To be sure, there are a few oases of “civilization” —mining towns, transportation centres, the occasional hunting and fishing lodge—but it is essentially an empty and harsh land. It is this view, which is shared by most Canadians, that is at the core of our “construction” of the north. As such it is a view which does not necessarily reflect reality so much as it does our own preconceived notions and prejudices. In other words, we view the north not as it really is, but rather as we wish to see it—or as our culture has taught us to see it. And while this problem of perception—this way of seeing—might seem like a minor issue, this paper (drawing heavily upon a longer book-length study ) seeks to demonstrate not only how our views of the north have been “constructed” but also that there are dramatic consequences which have flowed from our way(s) of viewing northern Manitoba between 1670 and 1930. The region that now comprises central and northern Manitoba has long been the subject of differing constructions. To begin with, although the records are sketchy and derive largely from European sources, it is clear that aboriginal peoples such as the Chipewyan/Dene, the Inuit of the Hudson Bay coast, and the various groups of Cree, Assiniboine, Ojibwa, and several groups of plains peoples contested for control of various sub-regions of this vast district long before Europeans arrived. And they, of course, viewed their homelands as being filled with both economic value and social and cultural significance. Then, in the post-contact era, Europeans representing English and French interests added their commercial and imperial constructions to this mix, which greatly exacerbated some of the existing rivalries between native groups, helped to alter diplomatic relations and land use patterns between various aboriginal groups, and were at least partially responsible for peoples such as the Western Ojibwa moving into the region from areas further to the east. Later still, individuals, non-government organizations, and representatives of the state from Canada, Great Britain, the United States and southern Manitoba added yet another layer of constructions, again redefining this region to suit their own interests and preconceptions. 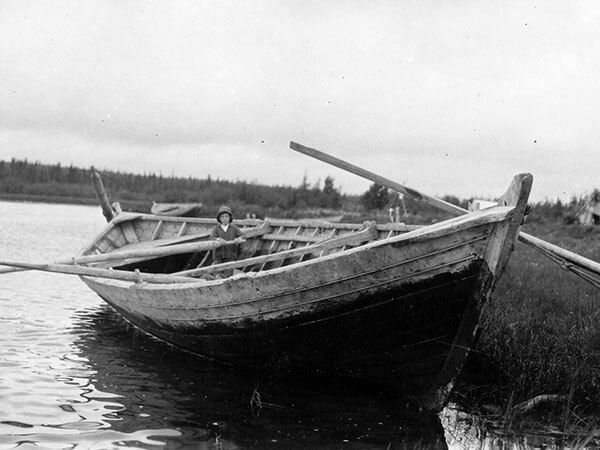 York boat at Oxford House, circa 1925. These sturdy boats, which for generations had been the primary cargo vessel for the north, would be increasingly supplanted by 20th-century arrivals like the steam locomotive and, later, the airplane. What is most remarkable about this 17th-century European perception is not that it was accurate, but that certain aspects of it held sway for so long—indeed, down to the present day. But this speaks to the ability of certain groups to construct and then maintain perceptions which accord first with their culturally determined prejudices, and then with their economic interests. For example, in the initial stages of exploration of Hudson and James bays, the environment of the region—so unlike anything most Europeans were accustomed to—struck fear in the hearts of the explorers who wintered there, and for good reason given the experiences of the Hudson, Button, Munk and James expeditions. Later, the HBC men who remained inside their “factories” waiting for the natives to arrive with furs from the interior, and for Company ships to hover into sight with their trade goods and the all-important supplies of European necessities, were also awed and frightened by their surroundings. The French, when they were in control of these Bayside posts, seemed better adapted to, and thus less intimidated by, their surroundings —but by the late 17th century a uniformity of opinion as to the usefulness of the land had arisen among the traders and their masters: it was a fur-trapping frontier, plain and simple—not a surprising conclusion given the economic interests and limited environmental perspective of these men. But it was a conclusion which flew in the face of a mounting body of evidence. Exploration into the regions beyond the Bay, and information garnered from native informants, indicated that the undifferentiated fur-trading hinterland of Rupert’s Land was a far richer and more diverse region then Europeans had initially imagined. As the aboriginal peoples knew, the vast region granted to the HBC by imperial fiat in 1670 was composed of several landscapes, linked by waterways, by inter-dependent ecosystems, and by the peoples who lived in its sub-regions. Quite consciously then, many of the HBC’s leading officials maintained that their construction of Rupert’s Land was the only correct one even though they had considerable reason to believe otherwise. Of course, from the HBC’s market-oriented perspective, this view made considerable sense. Increased settler populations would inevitably mean increased challenges to the Company’s trading monopoly and a limitation upon the hunting and trapping territories available to its native fur suppliers. Thus, information which might have inclined people to enter the region had to be either suppressed or disparaged. But during the 19th century interest in Rupert’s Land grew, both in Great Britain and Canada. As a consequence, Company officials found themselves increasingly forced to contradict views which Lord Selkirk and other representatives of the HBC had put forward when recruiting settlers for Red River, when attacking the North West Company in the courts, and when penning memoirs of their travels. While often humorous, this backtracking illustrated both how great was the desperation of the Company to keep people out of its territories and the simple fact that it was now fighting a losing battle. A new series of editorials by Brown, written in 1856, were even more pointed about the use-value of HBC territories and the advantages that opening up those territories would bring to the citizens of Toronto. Indeed, the Globe helped to spearhead a drive for the annexation of Rupert’s Land that same year: a drive which had the support of the Toronto Board of Trade, the Reform Party, several members of the Conservative Party in Canada West, as well as many individual businessmen. As the Globe and its allies saw matters, Canadian possession of Rupert’s Land would solve myriad problems: it would ease the land crisis in Canada West; it would open up trade possibilities for Toronto; it would secure “the best route for the Atlantic and Pacific Railway;”  and finally, it would counter American expansionism in the west. This was a powerful conjunction of interests in mid-century Canada West, for it appealed to the economic interests of farmers, merchants and railway men, while lashing out against both an anachronistic monopoly and the perfidious republic to the south. Of course, this construction of the western interior was just as artificially created and as self-interested as the HBC’s had ever been. If the interests of monopolistic mercantile capitalism had been paramount in the earlier construction, it was the somewhat more complex mixture of an emergent industrial capitalism, an expanding agricultural capitalism, and an aggressive mercantile capitalism from an ambitious sub-metropolis (Toronto) which sought to redefine Rupert’s Land to meet its interests and expectations. Trained in the American school of “manifest destiny,” and self-consciously comparing itself to the “success-story” of American expansionism,  the Canadian expansionist movement was linking economics with nationalism to produce its own variant of English-Canadian manifest destiny. 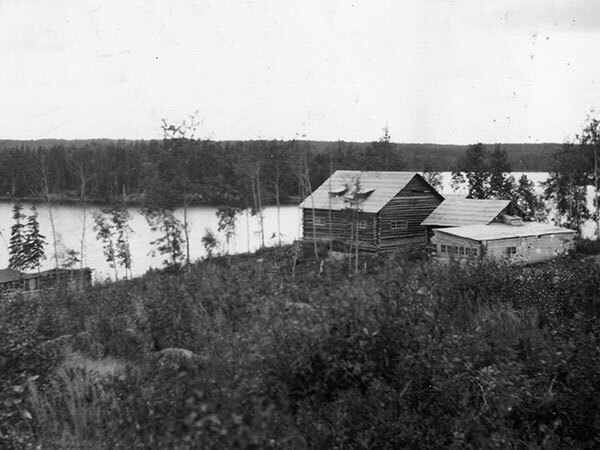 The “town” of Manitou Rapids, November 1915, was one of many settlements that grew on the burgeoning resource-based economy of northern Manitoba. While clearly a victory for the expansionist movement in Canada, these recommendations should also be seen as the triumph of a vision which had been emerging—despite the HBC’s best efforts—for quite some time concerning the potential of southern lands in the western interior. What made the victory possible in 1857 was the rapid growth of the Red River settlement,  American success with western settlement,  the now proven potential of railways to serve as more than just short portage roads, and a new set of attitudes in Great Britain—factors which coincided with and shaped the territorial and economic ambitions of expansion-minded Canadians. What would have been impractical 50 or even 25 years earlier was within the realm of possibility in the industrial age—particularly at a time when British investors and financial institutions were willing to invest quite heavily in North American railways. Clearly, the thriving settlement at Red River was on its way to annexation by Canada—or perhaps the United States if Canada did not act quickly enough to assert sovereignty. Either way, its future—and that of the other arable lands in the region—would be linked to the south and east, for although still tied to the old northern-oriented fur trade, the diminishing importance of that trade—caused by a fall in fur prices and the lack of fine furs in many districts —and the growing importance of the buffalo robe trade and agriculture, turned Red River towards the south and the rapidly developing American transportation network. Indeed, by the late 1850s and early 1860s, most trade goods and exports were passing in and out of Red River via the United States, and even the HBC was eschewing its northern water transportation route in favour of cart-brigades, steamboats, and US railways when supplying its southern establishments. As a result, not only was the northern fur trade faltering, but northern transportation centres such as York Factory and Norway House were suddenly diminished in importance. In effect, just as Red River and the surrounding southern district were being drawn into the world of agrarian capitalism, competitive mercantile capitalism, industrial capitalism, and the nation state, the north was becoming an increasingly isolated and irrelevant outpost of monopolistic mercantile capitalism, seemingly of interest only to fur traders and missionaries. Clearly, no one was yet ready to take up “the challenge” which W. L. Morton later insisted was “the main task of Canadian life” —that is, to “make something” of the northern Shield, our collective and “formidable heritage.”  In other words, no new construction had yet been placed upon the region to replace the dour 17th-century view of the fur traders or the variation on that theme developed by 19th-century missionaries. And, as if to prove this exact point, when the HBC and the British and Canadian governments began negotiating the transfer of Rupert’s Land in the aftermath of Confederation, those negotiations were concerned primarily with compensation for arable southern lands. After two years of haggling, this “real-estate transaction” was completed in the fall of 1869, pending only the payment of £300,000 to the HBC. Canada, really only a self-governing colony itself, stood poised on the brink of acquiring its own empire; an empire which included not only the much desired arable lands of the south but also the vast and now seemingly valueless north. Appearances, can, however, be deceiving. If only they had known what was in store for them the people of the north might very well have mounted a resistance of their own, for as Canadians and Manitobans—to say nothing of Britons and Americans—discovered how “to make something” of the Shield, it would be the natives who would pay the heaviest price for the new construction that was about to be imposed upon their homeland. The groundwork for that construction began to be laid as soon as Canada assumed control, for even before its political leaders had decided what to do with all parts of their new acquisition, certain administrative functions had to be looked after in order to bring it within the parameters of the new nation state. Commencing in 1870 and proceeding until 1912 a series of political and administrative divisions were superimposed upon the former Rupert’s Land: in 1870 the “postage stamp” province of Manitoba was created, as was the North West Territories; between 1871 and 1876 Indian treaty groups, Superintendencies, and, a bit more gradually, reserves, were added to the political/administrative map; and in 1875–1876 the NWT was split in two and Keewatin formed out of its less agriculturally valuable northeastern lands, while the remainder of the NWT was placed on the road to responsible government. Then, in 1881, Manitoba was extended at the expense of Keewatin’s southernmost lands (including, for three years, the “disputed territory” of northwestern Ontario), while the NWT and the Province of Ontario were respectively enlarged in 1882 and 1884 by the annexation of Keewatin’s western and eastern extremities, collectively the regions of Keewatin which held the most immediate economic value to whites. In 1905 the Provinces of Saskatchewan and Alberta were carved out of the NWT, while all of Keewatin and all territories not yet included in any province were lumped into the reformed NWT, pending the outcome of the bitterly contested Manitoba-Saskatchewan-Ontario-Quebec boundary question. Finally, in 1912, the map was redrawn one last time and, with the exception of Nunavut and part of Labrador, the present day configurations of mainland Canada—and Manitoba—were set. In effect, with considerable government aid, the region was turned into the entrepreneur’s north—a land of unlimited economic opportunity for whites—between 1870 and 1912. The most dramatic change in the construction of the “new north” was, however, still to come, for although “modern” enterprises such as steam-powered transportation services, and commercial fishing and lumbering had been added to the north’s now competitive fur trade, the region was not yet a full-fledged industrial frontier. It was still sparsely populated, still predominantly native, and still, in many regards, strikingly similar to the fur trade wilderness of the 17th and 18th centuries. But this was about to change as the discourse of “developmentalism” hit its stride. The steady expansion of mining, hydro-electric development, pulp and paper mills and timbering operations in Northwestern Ontario had all been watched very carefully (and enviously) by the political elites of Manitoba from the early 1880s onwards. Moreover, hydro-electric developments in the southerly portions of Manitoba’s Shield territory at Pinawa and Pointe du Bois between 1903 and 1911, as well as small-scale mining “rushes” throughout eastern Manitoba and the Lake Winnipeg region from the 1870s through to 1911, heralded great things for similar lands and resources lying north of Manitoba’s 1881 border. And the steady northwestward expansion of Mackenzie and Mann’s rail lines during the 1890s and early 1900s had not only opened new agricultural lands on the western edge of Manitoba, but had steadily opened new timber and fishing frontiers in northwestern Manitoba and beyond, while the extension to The Pas (1907) brought modern transportation services to the edge of what was not only a vast forest zone, but what was already thought to be a very promising mineral area. Meanwhile, their line into the Interlake had opened up quarrying operations in central Manitoba, such as those at Gypsumville. All in all then, by the early 20th century, something was finally being made of the Shield. 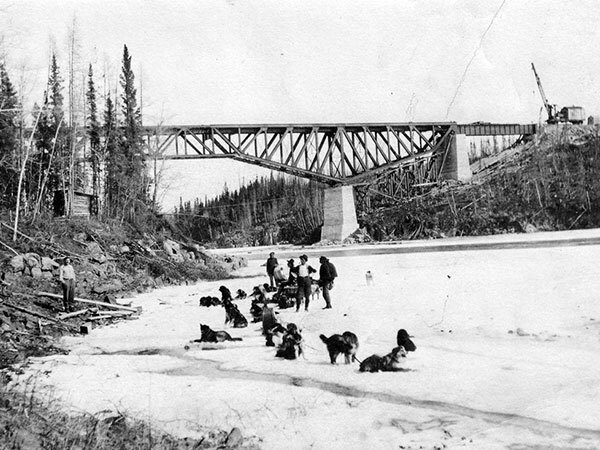 Aboriginal people and their dog teams arrive at the northern community of Manitou Rapids near the newly constructed Hudson Bay Railway bridge over the Nelson River, April 1916. The most encouraging sign to those who had begun to develop a vision of northern development was that just as Manitoba assumed political control over the north in 1912 a new rail line across the entire region was in the works. Ironically though, this federally funded railway would be pushed across the north from Mackenzie and Mann’s flimsily constructed railhead at The Pas not to promote northern development, but to give western farmers the supposed advantage of the shorter Hudson Bay shipping route to market their crops in Europe. Whatever the rationale for this line though—and it is quite clear that in the short-term, the Laurier government’s decision to start construction just in time for the federal election of 1911 was a political sop to western farmers —its timing could scarcely have been better for Manitoba’s political and economic elites. 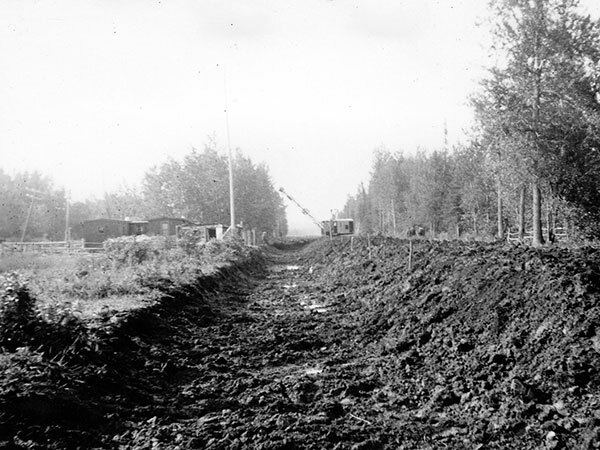 The commencement of what became known as the Hudson Bay Railway (HBR) project not only coincided closely with the boundary extension, but also with the rapid improvementof the capital-intensive technologies necessary for the exploitation of resources such as mineral-bearing quartz, hydro-electric power, and pulpwood. With a railway being constructed into the north, whose use-value had been steadily increasing since 1870, and whose wealth had been steadily mapped by men such as J. B. Tyrrell of the Geological Survey of Canada since before the turn of the century,  the region was set to emerge as an industrial and investment frontier of some magnitude. Politicians and businessmen now cast the north as Manitoba’s economic hinterland par excellence. Indeed, even before the territory north of the old provincial boundary was added in 1912, the Norquay, Greenway and Roblin governments had been dabbling in the game of developmental politics in the north. Emulating the federal government, these administrations had provided large-scale aid for northward-running railways such as the original version of the Hudson Bay Railway project, part of which evolved into Mackenzie and Mann’s Canadian Northern Railway. They had also granted timber-cutting rights in the province’s small public domain on terms even more generous than the Dominion had offered,  and had lobbied hard for both the federally funded Hudson Bay Railway and for provincial control over the north. More to the point, they and the Winnipeg business community had developed their own construction of the north: it was still empty—in human terms—but it was now an incredibly valuable treasure trove just waiting to be fully developed. After boundary extension brought the north under Manitoba’s political control, Premiers Roblin, Norris and Bracken—while representing three quite distinct political parties/movements —proved to be very much in accord on northern development: the north had to be exploited as quickly and as efficiently as was humanly possible for the economic benefit of the province. Norris and his two Commissioners of Northern Manitoba were very clear on these points, but it was Premier John Bracken, elected to the provincial house from the sprawling northern constituency of The Pas, who was the most direct in this regard. Indeed, his campaign speeches of 1922 are rife with examples of this construction of the north as the new economic hope of Manitoba;  an interesting perspective for a former Professor of Agriculture. Of course, in this quest for northern “development,” each of these administrations believed that private interests should lead the way. This was partially an ideological perspective, but also a practical consideration: all three administrations were laissez-faire in their core philosophy, but just as importantly, all three were perpetually starved for funds. Thus, they neither believed it appropriate, nor did they have the resources, to take the lead in northern development. This meant that the provincial government would let the entrepreneurs who had the requisite capital and technological expertise set the agenda of northern development in Manitoba, just as federal governments had done from 1870 onwards. At best, the provincial government would try to influence that agenda so that broader “provincial interests” could be served, an approach best illustrated by Premier Bracken. He, more than any other of Manitoba’s political leaders, had a fully integrated view of how to develop the potential of the north. Thus, in the 1920s, even as Bracken fought for provincial control over natural resources and worked towards encouraging more hydro development and the creation of a pulp and paper mill on the eastern edge of Manitoba’s Shield country,  he gave considerable attention to more northerly projects. In one notable case he sought to have two mining companies join forces to develop a massive (270,000 h.p.) power site at White Mud Falls on the Nelson River to provide hydro-electric power for their mine sites and the town of The Pas. Bracken and his Winnipeg-based advisors on the Industrial Development Board of Manitoba believed that this power development would have wonderful “multiplier” effects: it would lead to the establishment of a pulp and paper mill near the dam site, facilitate the creation of a series of smaller mines along the route of the proposed transmission line, provide power to mines then under development in northeastern Manitoba, and perhaps even be used to send excess power to southern Manitoba. Unfortunately for Bracken though, the mining companies in question refused to fall into line, and his plan came to nought. Still, even when disappointed by developers in such matters, provincial administrations remained supportive. If they could not influence the precise pattern of development they could at least serve developers—and thereby ensure that some form of economic growth took place—by subsidizing the costs of transportation infrastructure, as both Premiers Norris and Bracken sought to do for the Flin Flon project, and by helping to arrange for important royalty and resource-use concessions from the Dominion on behalf of developers, as was done for a number of mining operations and the province’s first pulp and paper mill. Of course, one might well ask what was “in it” for the provincial government, particularly given that all resource use/royalty fees from such projects would go to the federal government until 1930. Despite this limitation the province still saw huge advantages in aiding and promoting such mega-projects. First and foremost there would be economic growth and new jobs, the holy grail of most liberal-democratic governments. The creation of appropriate transportation infrastructure, the building of physical plant and the construction of whole towns could create thousands upon thousands of temporary jobs along Manitoba’s resource frontier as well as a few thousand “permanent” jobs. And the spin-offs of such projects for the populated south were also considerable. As the Industrial Development Board was quick to point out, southern Manitoba in general and Winnipeg in particular were the recipients of major boosts to their economies as a direct result of providing goods, services and workers for the north. Indeed, at the height of the building boom in the late 1920s, the Board proudly announced that mining companies alone were spending over $1,000,000 per month in Winnipeg. Indeed, with approximately $120,000,000 worth of private and government investment capital being pumped into various projects along the Manitoba Shield between 1925 and 1930 it was hard not to be a “booster” and to see all of this development as an unalloyed social good. Who would not be excited by the prospect of the $27,000,000 invested by HBM&S at Flin Flon; the $6,000,000 by Sherritt- Gordon at Sherridon; the $6,000,000 by five mining companies in the Central Manitoba / Rice Lake mining division; the $10,500,000 by Winnipeg Hydro at Slave Falls; the $12,000,000 by the Winnipeg Electric Company at Seven Sisters; the $9,500,000 by the Manitoba Paper Company at Pine Falls; and especially the $40,000,000 spent by the Canadian National Railways to rehabilitate the existing line, build the new line to Churchill and construct a town site and port facilities there? Even without access to resource-use fees and royalties the Provincial Treasury stood to gain directly from such development. As Premier Bracken noted when he gave his approval to royalty exemptions for Hudson’s Bay Mining and Smelting Company (HBM&S)—rather blithely signing away millions of dollars in royalty fees that would have been Manitoba’s after 1930—there were also provincial taxes that could be levied on resource developers. All in all then, the north—in its new industrial guise—was seen as a real boon to the provincial economy from 1912 onwards, but especially during the late 1920s— the moment when the next phase of northern development truly commenced. 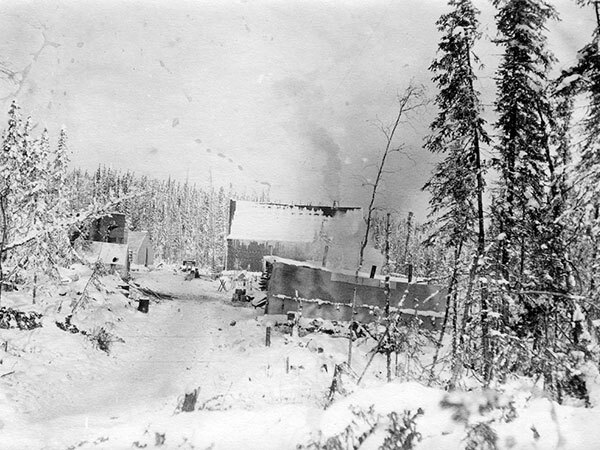 Site of the original discovery of what would become the HBM&S mine at Flin Flon, early 1920s. Although this image captures the natural beauty of the area, it would not look like this much longer. The lake in the background was later drained, all greenery was destroyed, and the area was completely altered by 1930. Of course, it almost goes without saying that in the quest to “make something” of the Shield, it was deemed necessary to give the real heroes of northern development— the brave men willing to risk their lives, or at least their capital—a certain amount of latitude, and not just with resources but with the environment itself. Timbermen, commercial fishermen, and some fur trappers blazed the way in this regard. Manitoba’s forests, for example, were clear-cut and misused to such an extent in the process of removing over 1.5 billion feet of sawn lumber, 12 million linear feet of building logs, 4 million railway ties, 1.3 million cords of pulp and firewood (and at least double that amount if all timber—cut legally and illegally—is accounted for), that by 1930 only a few areas of Manitoba were still suitable for procuring merchantable timber. Indeed, an industry which had once provided employment to thousands and supported scores of companies was now reduced to only a handful of operations—at least one of which had to rely upon timber from Saskatchewan rather than Manitoba. Meanwhile, in the course of taking somewhere between 0.5 and 1 billion pounds of fish from Manitoba’s lakes  commercial fishing companies had effectively wiped out sturgeon stocks and so badly over-fished other stocks that by the early1930s the average size of the whitefish taken on Lake Winnipeg (the backbone of both the commercial and subsistence fishery) had fallen dramatically,  proof positive of the harmful effects of the over-fishing which the region’s first Fishery Inspector had decried as early as 1884. Finally, certain animal stocks were almost completely trapped and hunted out of existence by the late 1920s in parts of the north, a phenomenon which one experienced game guardian attributed exclusively to the arrival of white trappers in the north after the railway opened up the region. But all of this was really only the tip of the iceberg. Along the eastern portion of Manitoba’s Shield territory, the hydro-electric plants created at Pinawa, Pointe du Bois, Great Falls, Seven Sisters, and Slave Falls between 1903 and 1931, would forever alter the flow, the fish stocks, the animal habitat, and the landscape of the Winnipeg River region. The same region’s long-sought-after pulp and paper mill, finally established by a consortium of U.S. and Canadian interests in 1927 at Pine Falls, (after they were granted a pulpwood cutting zone that included over 30,000 square miles as a selection area and that basically ran from Ontario to Saskatchewan ) would lead to even more clear-cutting of Manitoba’s forests, to say nothing of the pollution associated with its plant. But most fascinating of all is the case of northern Manitoba’s first multi-million dollar mining operation, the copper and zinc mine and smelter complex of HBM&S at Flin Flon. One could give many more such examples of how the north was “altered,” but the point is clear—northern development implied serious, and often permanent, environmental costs. Of course, it can be argued, as the provincial and federal politicians who granted developers the right to use resources and the environment in the way that they did, and as W. L. Morton and other Manitoba historians have done since then, that northern development was well worth the price. Indeed, as anyone who has read Morton’s monumental survey of Manitoba history knows, he wrote with undisguised zeal about the re-unification of north and south in the 1912 boundary extension and about the subsequent development of northern Manitoba’s resources. He expressed no misgivings about how Manitobans—and foreign investors—had finally “made something” of our formidable heritage. And perhaps this view is understandable: by the early 1930s, where there had once been “nothing,” there now stood a whole series of industrial outposts—connected to the south by umbilical cords of railways, transmission lines, and capital—producing millions upon millions of dollars of wealth, providing homes and employment for thousands of Manitobans and offering some escape from what Harold Innis referred to as the western Canadian “staples trap” of wheat production. But it needs to be observed that those residing in the southern portions of Canada could “afford” this view: after all, it wasn’t really their homeland that was being “developed.” The majority of Canadians during this era viewed the north in much the same terms the HBC developed so long ago: it was a great and empty land—a tabula rasa to be written upon as emissaries of “civilization” pleased. What had changed, of course, was that since the 19th century, capital and technology became available which was capable of doing far more than the HBC ever dreamed possible. Instead of the limited terms of exchange-based mercantile capitalism, which had its own negative impact upon the land and its peoples,  it became possible to think in terms of industrial capitalism and southern-oriented cost-benefit ratios, and to impose those terms upon the north in an updated construction of the region as an industrial frontier. Alterations in the landscape, which would never be contemplated in arable regions, were completely acceptable: drain a lake and flood the surrounding area, sure, there are 100,000 more where that came from; pollute vast areas, why not, no one lives in the north; cut all the trees over a vast region, no problem, they would just burn in forest fires if they weren’t harvested; dam every fast-flowing northern river, flooding vast areas of land, altering delicate ecosystems and wiping out entire segments of the subsistence economies of natives so that southerners could have “cheap” power (and even export it to the United States)—of course, it was for the common good. There were, of course, two key problems with this view. First, it was a construction which derived from economically, ecologically, and culturally chauvinistic assumptions, designed and maintained by and for the benefit of people living outside of the region. Second, it was a construction that has been forced upon the people living in the north; the very people who had to adapt to its consequences. And in central and northern Manitoba, there is no denying the baneful—and very real—effects of rapid, shortsighted development projects upon the material, social, and political bases of aboriginal life. Of course, in the here and now of the 21st century, we do seem to have learned some important lessons. The voices and concerns of First Nations peoples are increasingly taken into account when northern development is under consideration and no major project can be undertaken without an extensive environmental review being conducted. Still, while we should be pleased that northerners are now important parts of a discourse on the development of their homeland, it cannot be forgotten that from 1670 until the second half of the 20th century, as new use-values were found for their homelands, and as government and capital worked to “harvest” that value, First Nations peoples paid a huge price. Subsistence bases were continually eroded, access to land and other resources was steadily restricted, the land itself was altered for all time, and the people were subjected to a massive program of social engineering on the reserves and in the residential schools—all because it fit within the new, externally imposed construction of their homeland. Thus, simple “ways of seeing”—be they in the past or the present—have a way of leaving indelible marks. The road from Mafeking to The Pas under construction, July 1936. 1. Jim Mochoruk, Formidable Heritage: Manitoba’s North and the Cost of Development, 1870 to 1930. Winnipeg: University of Manitoba Press, 2004. 2. Standard European sources which make note of these conflicts include the appropriate volumes of R. Thwaites (ed) The Jesuit Relations and Allied Documents; Samuel Hearne, A Journey from Prince of Wales Fort, in Hudson’s Bay to the northern ocean: undertaken by order of the Hudson’s Bay Company for the discovery of copper mines, a north west passage, etc. in the years 1769, 1770, 1771 and 1772. London: A Strachan and T. Cadell, 1795; and A. G. Doughty and Chester Martin (eds.) The Kelsey Papers. Ottawa: Public Archives of Canada and Pubic Record Office of Ireland, 1929. The secondary literature is too voluminous to list. 3. The pre-contact locations of the various groups who have lived in northern and central Manitoba is the subject of considerable debate. The Ojibwa are the most famous example of a First Nations People moving into the region after contact, but there is debate on the pre-contact location of virtually every aboriginal grouping. For almost one hundred years scholars believed that the Chipewyan/Dene, had lived in the boreal forests of the Lake Athabaska and Churchill River regions prior to being pushed northwards by the Cree sometime before contact. More recent authors have argued for more northerly pre-contact homelands such as the tundra and the transitional forest zone. For the traditional view see Emile Petiot, “On the Athabaska District of the Canadian North-West Territories,” Proceedings, Royal Geographic Society. Vol. 5, 1883, pp. 633-655. This was echoed in the work of Diamond Jenness and others. A more recent set of interpretations, with the more northerly interpretation is represented in the work of Colin Yerbury, “The Post-Contact Chipewyan: Trade Rivalries and Changing Territorial Boundaries,” Ethnohistory, 1976 Vol. 23 No. 3, pp. 237-263. On the Ojibwa see, Laura Peers, The Ojibwa of Western Canada, 1780-1870. Winnipeg: University of Manitoba Press, 1994. On the Cree see David Meyer, “Time-Depth of the Western Woods Cree Occupation of Northern Ontario, Manitoba, and Saskatchewan,” Papers of the 18th Algonquian Conference, William Cowen (ed.) Ottawa: Carleton University Press, 1987, pp. 187-200. 4. The Assiniboine, for example, maintained that Ik-Tomi created the world and that Lake Winnipeg was the centre of this world. Given what the geological and archeological record has to say about the region, as well as the work of historical geographers, anthropologists, ethnographers and ethno-historians, it is highly unlikely that the Assiniboine or anyone else had inhabited this region since “time immemorial”—no one after all was living in this region when it lay under a glacier or glacial Lake Agissiz. Indeed, given the Assiniboines’ connection to other Siouxian-speakers, it is probable that they hailed from regions considerably to the south and east of Lake Winnipeg. Thus the aboriginal perception of the north as an ancestral “homeland” was, in many regards, just as much a construction as later European views. However, the various aboriginal groups had a much more organic relationship to the land and its resources than did the later Europeans, and they certainly had a much longer claim upon the lands of North America than these newcomers. 5. Henry Hudson (1610), Thomas Button (1612–13), Jens Munck (1619–20), Luke Foxe (1631) and Thomas James (1631) were all leaders of marine expeditions into the Bay, and all—to one extent or other—were seeking the Northwest Passage. See John Warkentin, The Western Interior of Canada. Toronto: McClelland and Stewart, 1972 edition, p. 11. 6. Even in the early days of the fur trade, however, there were considerable differences in the reasons offered up to explain why this wilderness was inhospitable. In one rather remarkable twist, representatives of the HBC claimed that the failure of agriculture around some of their northerly posts had nothing to do with climate, but was caused by the super-fertility of the soil, which had lain fallow since creation. See D. W. Moodie, “Early British Images of Rupert’s Land,” in Richard Allen (ed), Man and Nature on the Prairies. Regina: Canadian Plains Research Centre, 1976, p. 7. 7. All four of these expeditions suffered very high mortality rates, usually attributable to scurvy. The climate and the lack of familiarity in dealing with such an environment almost certainly contributed to this death toll—although being set adrift by a mutinous crew also added to this toll in the case of Henry Hudson. For a brief account of these voyages see W. L. Morton, Manitoba: A History. Toronto: University of Toronto Press, 1957, pp. 3–8; and the introduction to James F. Kenney (ed.) The Founding of Churchill, Being the Journal of Capt. James Knight, Governor-in-Chief in Hudson Bay from 14th July to 13th September, 1717. Toronto: J. M. Dent and Sons, 1932. 8. The best account of the French experience at the Bay is that of Nicholas Jérémie. His 20 years at Fort Bourbon (York) made him a valuable source of information on the region. It is clear that he made heavy use of native descriptions of the interior, as well as those of Henry Kelsey, and was aware of some of the resources to be found there. He also kept the first successful garden in the region. See R. Douglas and J. N. Wallace (eds. and trans.) Nicholas Jérémie, Twenty Years of York Factory 1694–1714, Jérémie’s Account of Hudson Strait and Bay. Ottawa: Thorburn and Abbot, 1926—the original French edition was published in 1720. 10. Although the full body of Kelsey’s journals were not “discovered” until 1926 and not published until 1929—see A. G. Doughty and Chester Martin (eds.) The Kelsey Papers. Ottawa: Public Archives of Canada and Pubic Record Office of Ireland, 1929—there were clearly those who knew of their existence in the 18th century. Indeed, a lengthy portion of the second half of his journal covering western exploration was published as an appendix to the report of Select Committee which was struck to investigate the alleged inactivity of the HBC in 1749. See United Kingdom, Report from the Committee Appointed to Enquire into the State and Condition of the Countries Adjoining to Hudson’s Bay, and of the Trade Carried on There. London: 1749. Just as importantly, Arthur Dobbs had a copy of Kelsey’s journals, but did not use them in his 1744 work, An Account of the Countries Adjoining to Hudson’s Bay, in the North-West Part of America. London: J. Robinson, 1744. Because Kelsey’s description of the barren lands of the interior did not accord with the more positive image Dobbs sought to portray, he was willing to suppress those journals. Thus, both those who wished to construct positive and negative images of the economic potential of the western interior ignored Kelsey’s eye-witness accounts. 12. United Kingdom, Report from the Select Committee on the Hudson’s Bay Company. London: 1857, p. 45. 13. The explorations of Kelsey in the 1690s, the information that came out of the French explorations of the southern portions of Rupert’s Land during the 1730s, ‘40s and ‘50s, the data compiled during Dobbs’ inquiry, the Anthony Henday excursion of 1754–55, and then the far more voluminous reports of the post commanders who set up shop everywhere between the “petite nord” and the Pacific Slope from 1774 to 1821, and reports of the surveyors and explorers employed by the HBC and the NWCo., as well as the growing raft of scientific reports produced in the years following Franklin’s first expedition, all provided information which indicated that the Company’s domain was a very rich and diverse empire with many possible uses other than fur trading. For a sampling of these reports see Warkentin, The Western Interior of Canada. 14. For early pro-Company perspectives on the agricultural potential of Red River see, Andrew Amos, Report of the Trials in the Courts of Canada Relative to the Destruction of the Earl of Selkirk’s Settlement on the Red River, with Observations. London: 1820; and United Kingdom, Papers Relating to the Red River Settlement. London: 1819. Most interesting by far, though, is George Simpson, Narrative of a Journey Round the World, During the Years 1841 and 1842. London: H. Colburn, 1847. Members of the Select Committee of Inquiry in 1857 took great delight in quoting various passages of this book back at Simpson, particularly those which were most glowing in their descriptions of the landscape, soil, and climate of various portions of Rupert’s Land. 15. On this early history of missionary activity in Rupert’s Land see, John Webster Grant, Moon of Wintertime: Missionaries and the Indians of Canada in Encounter since 1534. Toronto: University of Toronto Press, 1984, Chapter Five. 16. United Kingdom, Report from the Select Committee ... 1857, pp. 245-246. 17. Paul Kane, The Wanderings of an Artist among the Indians of North America. Edmonton: Hurtig, 1968—reprint of the 1859 original. Kane simply gushed over the HBC and compared its Indian policy very favourably with that of the United States. For critical comments on Kane’s style and interpretations see, J. Russell Harper, Paul Kane’s Frontier. Toronto: University of Toronto Press, 1971; and Diane Eaton and Sheila Urbanek, Paul Kane’s Nor-West. Vancouver: University of British Columbia Press, 1995. 18. Represented most famously by the Sayer trial of 1849, but really a battle which had been going on for several years. See W. L. Morton, Manitoba: A History. Toronto: University of Toronto Press, 1957, pp. 73-78. 19. These writings are legion, and they began almost as soon as the first missionaries had the time to set their thoughts down on paper. Thus, the first CMS missionary into the region, the Rev. John West, had published his far from positive comments almost as soon as he had left the interior. See John West, The Substance of a Journal during a Residence at the Red River Colony, British North America; and Frequent Excursions among the North-West American Indians in the Years 1820, 1821, 1822, 1823. London: 1824. 20. See for example, Alexander Isbister, A Few Words on the Hudson’s Bay Company: With a Statement of the Grievances of the Native and Half-Caste Indians. London: C. Gilpin, 1847. 21. Editorial, The Toronto Globe, 12 November 1850. 22. Alexander Isbister, who had been born in the interior, but educated in Scotland and England, had been acting as the London agent of the pro-free trade forces in the western interior during the 1840s. In that capacity he not only presented Red River petitions to the Imperial government, but had also authored a larger presentation which encompassed many of the grievances of the people of the North West. See Isbister, A Few Words on the Hudson’s Bay Company. For an equally critical contemporary view of the HBC, see James Fitzgerald, An Examination of the Charter and Proceedings of the Hudson’s Bay Company. London: 1849. 23. Editorial, The Toronto Globe, 12 November 1850. 24. The Daily Globe, 28 August 1856. 25. This agitation is well covered in Doug Owram, Promise of Eden: The Canadian Expansionist Movement and the Idea of the West, 1856–1900. Toronto: University of Toronto Press, 1980, Chapter 2; and W. L. Morton, The Critical Years: The Union of British North America, 1851–1873. Toronto: McClelland and Stewart, 1964, Chapter 2. 26. The Daily Globe, 10 December 1856. 27. As George Brown put it, “Let the merchants of Toronto consider that if their city is ever to be made truly great—if it is ever to rise above the level of a fifth rate American town—it must be by the development of the great British territory lying to the north and west.” Ibid., 26 December 1856. 28. United Kingdom, Report from the Select Committee on the Hudson’s Bay Company. London: 1857, “Appendix No.12—Petition from the Board of Trade of the City of Toronto to the Legislative Council, presented 20th April, 1857,” p. 435. 29. The United Province’s representative, Chief Justice Draper, was the subject of several attacks in the expansionist press for his extremely cautious brief. He asked the British Parliament to set the boundary between Canada and the HBC along the lines established by the French prior to the Conquest. See Ibid. “Appendix No. 5 and No. 6,” pp. 374–380. 33. The settlement’s population had increased from 5,291 to 6,523 between 1849 and 1856 alone. See Ibid. “Appendix 2 (B)” p 363. 34. The dramatic growth of Minnesota was very much in the minds of several Select Committee members. This comes through most clearly in the questioning of Simpson. 35. This was all the more ironic given that native voices were noticeably absent from the inquiry. 36. Two separate exploration parties had been sent out to Rupert’s Land in 1857 to ascertain the value of the western interior for settlement—Captain Palliser’s British party and Henry Youle Hind and Simon Dawson’s Canadian group. See Irene Spry, The Palliser Expedition: An Account of John Palliser’s British North American Expedition, 1857-1860, Toronto: The Macmillan Company, 1963; and Henry Y. Hind, Narrative of the Canadian Red River Exploring Expedition of 1857 and of the Assiniboine and Saskatchewan Exploring Expeditions of 1858. London: Longman, Green, Longman, and Roberts, 1860. 37. In 1859 Parliament declined to renew the Company’s licence for exclusive trade, but it also refused to withdraw the Company’s charter. Thus, while it lost control over the Pacific slope, the Company did not lose any power in districts far removed from settlements in Rupert’s Land. 38. The best account of Minnesota’s territorial ambitions, as well as the best account of the growing commercial and transportation ties between Rupert’s Land and Minnesota, is Alvin Gluek Jr. Minnesota and the Manifest Destiny of the Canadian Northwest: A Study in Canadian-American Relations. Toronto: University of Toronto Press, 1965. 39. The immediate cause of the drop in fur prices was a simple change in fashion. Beaver felt was being replaced by silk in the manufacture of hats in the 1840s. The lack of fine fur was the result of over-trapping during the competitive period and also to the cyclical nature of animal populations in the wild. 40. Glynder Williams “The Hudson’s Bay Company and the Fur Trade: 1670-1870,” The Beaver, Autumn 1983, p. 81; and W. L. Morton, Northern Manitoba—1950. Winnipeg: Government of Manitoba, 1950, pp. 39-41. 42. David McNab, “The Colonial Office and the Prairies in the Mid-Nineteenth Century,” Prairie Forum, Spring 1978, pp. 21–38 and W. L. Morton, The Critical Years: The Union of British North America, 1851–1873, pp. 39-40. 43. From 1858 to 1864 the United Province of Canada’s Assembly was so badly divided that something as divisive as the addition of new territories—where language and minority rights would have to be dealt with—could not even be contemplated. 44. E. A. Mitchell, “Edward Watkin and the Buying-Out of the Hudson’s Bay Company,” Canadian Historical Review, September 1953, pp. 219–244. 45. Hart Bowsfield (ed.) The Letters of Charles John Brydges, 1879–1882. “Introduction by Alan Wilson,” Winnipeg: Hudson’s Bay Record Society, 1977, pp. xi-xvii; and E. E. Rich, Hudson’s Bay Company, 1670–1870, Vol. III: 1821–1870. Toronto: McClelland and Stewart, 1960, p. 848. 46. W. L. Morton, The Canadian Identity, 2nd edition. Toronto: University of Toronto Press, 1972, pp. 4-5. 47. Canada, Report of the Delegates Appointed to Negotiate for the Acquisition of Rupert’s Land and the North-West Territory. Ottawa: Queen’s Printer, 1869. See especially pp. 7–8 and 17–27. 48. Morton, Manitoba, p. 117. 49. While there is no shortage of works which address this point in many different ways—from Morton’s introduction to Alexander Begg’s Journal of the Red River Resistance and Other Documents. Toronto: Champlain Society, 1957 through to Gerhard Ens’ Homeland to Hinterland: The Changing Worlds of the Red River Metis in the Nineteenth Century. Toronto: University of Toronto Press, 1996—one of the most revealing and surprisingly “modern” and “non-primitive” assessments of the use-values of the resources of Rupert’s Land comes from the participants at the Convention of Red River delegates in February of 1870. At this convention Riel raised the allied issues of provincial status and beneficial control over natural resources, points which were enlarged upon by W. B. O’Donoghue. Their comments went far beyond demands for farm lands and included grazing lands and timber resources. Indeed somewhat later, in article 12 of the controversial “third list of rights,” Riel’s Provisional government went even further, indicating that it anticipated the development of a mining industry in the North West and that it should be in a position to direct and control the development of that industry for the benefit of the people of the proposed super province of Assiniboia. See, “Proceedings in the Convention, February 3 to February 5, 1870,” reprinted in W. L. Morton (ed.) Manitoba: Birth of a Province. Winnipeg: Hudson’s Bay Record Society, 1965, pp. 6–8 and 17–18. See also “The Second List of Rights,” “The Third List of Rights,” and “The Fourth List of Rights” in Ibid., Appendix 1. 50. As W. L. Morton put it, “The Company ceased to rule in the West ... [but] in the northern forest it remained in fact the dominant influence and continued to trade as in the past. Morton, Northern Manitoba, p. 86. 51. For a discussion of this battle see Mochoruk, Formidable Heritage, Chapter Five. 52. See, Manitoba, Sessional Papers, (MSP) 1917–1921. “Report of the Commissioner of Northern Manitoba for the year 1916”; Ibid., 1919; and J. A. Campbell, Manitoba’s Northland: Including Hudson Bay Region and Rice Lake Gold Area. The Pas: Office of the Commissioner of Northern Manitoba, 1918. For an outstanding example of the role of the Commissioner as propagandist for northern development see R. C. Wallace (Campbell’s successor) Report and Recommendations with Reference to Proposed Railway from The Pas to Flin Flon Property, The Pas: Office of the Commissioner, 31 January 1921. 53. The best account of the rationale behind this transportation system can be found in A. J. Ray, “Adventurers at the Crossroads: At Momentous Meetings in 1871 the future of the HBC was charted,” The Beaver, April/May 1986, pp. 5-12. 55. This largesse is only partially outlined in official documents such as the Dominion Lands Act of 1872, its subsequent amendments, and the various regulations set out concerning timber, grazing, mining and other such lands by the Department of the Interior. Regulations, save for those covering homestead lands, were regularly ignored both by Dominion officials and the people who moved into the North West. See for example, Mochoruk, Formidable Heritage, pp. 19–24, 49–53, and 78–96. 56. For the 19th century development of these industries see Ibid., Chapters Two and Three. It is of considerable importance that many of the new resource entrepreneurs were—or would soon become—very influential in political as well as economic circles. John Christian Schultz, who was engaged in a wide variety of early northern enterprises, including a scheme to create a railway to Hudson Bay in the 1880s, Theo Burrows, the brother-in-law of Clifford Sifton, and the leading timberman on Manitoba’s northwestern frontier, and D. C. Cameron, one of the most important timber magnates in the Kenora region, would all became active in politics and cap their careers with stints as Lieutenant-Governors of Manitoba. Somewhat lesser lights such as Hugh Sutherland (timber and the original Hudson Bay rail line project), Hugh Armstrong (the fish and fur trades), and several more such men all had federal or provincial political careers of some magnitude—while the great railway men and all-round entrepreneurs, Mackenzie and Mann and J. D. MacArthur, had impeccable political connections to provincial and federal administrations from the 1880s onwards. 57. Ray, “Adventurers at the Crossroads,” pp. 6–9; and Eleanor Stardom, “Adapting to Altered Circumstances: Trade Commissioner Joseph Wrigley and the Hudson’s Bay Company, 1884–1891,” Winnipeg: unpublished University of Manitoba MA thesis, 1987, pp. 3–7. 58. The background of the men who sought to make their fortunes in the lumber trade is dealt with in Mochoruk, Formidable Heritage, Chapter Two. See especially footnotes 4 and 5. 59. By 1912 the fishing industry of Manitoba was almost totally controlled by Booth Fisheries, via local intermediaries such as Capt. Robinson, the fur trade by the HBC and a few smaller companies like the Hyer Brothers, and the timber trade by Theo Burrows, Peter McArthur, Brown and Rutherford, and Captain William Robinson. Transportation was a bit more competitive, for the HBC’s attempt to create an inland transportation monopoly had failed. However, by the close of this period, the HBC and its partial subsidiary, the North West Navigation Company controlled most water-born traffic, while Mackenzie and Mann’s railway dominated transportation services in the northwestern portions of Manitoba. See Ibid., Chapters Three and Five. 60. See Morris Zaslow, Reading the Rocks: The History of the Geological Survey of Canada, 1842–1972. Toronto: the Macmillan Company of Canada, 1975, p. 104 and Part Two: “Growing Pains.” References to the promotional role of the GSC are scattered throughout this fine work. 62. The Department of Fisheries began appointing local Indian Agents such as H. Martineau as part-time fishery inspectors during the early 1880s. Unfortunately, while his position as an Indian Agent for the Treaty Two region made it possible for him to enforce the closed season upon natives—which they properly protested as a violation of their treaty rights—he was entirely unsuccessful in stopping white-owned fishing companies from fishing out of season. See, Canada Sessional Papers (CSP), 1884, Vol. 17, No. 3, #4, “Annual Report of the Department of Indian Affairs, 1883,” p. 61 and pp. 143-144. 63. See for example, Alexander Morris, The Treaties of Canada With the Indians of Manitoba and the North-West Territories. Toronto: Belfords, Clarke and Company, 1880, p. 149. 64. This could be taken to quite incredible lengths. When the town of The Pas sought to promote itself to potential investors in the period after 1912, it wished to dispel its image as an “Indian” town, so the local Board of Trade not only downplayed the town’s native population figures—conveniently neglecting to mention that it was located right across the river from a major reserve—but the town fathers also managed to have the local Indian Agent impose a curfew upon Indians visiting the town. See, “Excerpt From a booklet Published Under the Authority of The Pas Board of Trade in 1914,” reprinted in The Pas: Gateway to Northern Manitoba. The Pas: The Pas Historical Society, 1983, p 24; and AM, MG 12 A22, “Claude Johnson—unpublished manuscript, ‘Northern Manitoba,’” p. 28. 65. See Mochoruk, Formidable Heritage, pp. 54-57, 87-88, and 98-100; and Frank Tough, ‘As Their Natural Resources Fail: Native Peoples and the Economic History of Northern Manitoba, 1870–1930. Vancouver: University of British Columbia Press, 1999, Chapter Nine. 66. Indeed, it was insisted that they become just like whites: band structures and political forms which were completely alien to these peoples were super-imposed upon them for the convenience of Canadian negotiators and administrators who didn’t know how to deal with the politically decentralized and fiercely independent groups of the sub-arctic. Nor was the political power of native women acceptable (or understandable) to Dominion officials and Indian agents; thus the political disenfranchisement of native women within their own society was put in train via a superimposed, and strictly male-oriented, hierarchy on each reserve, simply because in “civilized” society it was men who held power and influence—not women. For an excellent account of how natives were “kept in line,” see Vic Satzewich and Linda Mahood, “Indian Affairs and Band Governance: Deposing Indian Chiefs in Western Canada, 1896-1911,” Canadian Ethnic Studies, XXVI, No.1, 1994, pp 40-58. 68. For the best analysis of development in Ontario see H. V. Nelles, The Politics of Development: Forests, Mines and Hydro-electric Power in Ontario, 1849-1941. Toronto: Macmillan of Canada, 1974. See especially, pp. 18-47 and Chapters Two and Three. Manitoba kept very close tabs on such development, and cited the example of Ontario’s use of its natural resources in virtually every brief the province submitted in its quest for “better terms.” See for example, C.S.P., 1883, Vol. 16, No. 12, #108, “Copy of a Report of a Committee of the [Manitoba] Executive Council, March 8, 1883,” pp 10-12; and Ibid. “Memorandum of the Delegates of the Executive Council of Manitoba ... February 7, 1882” pp. 2-3. 69. For a detailed analysis of these developments, see Mochoruk, Formidable Heritage, Chapters Three through Five. 70. Howard Fleming, Canada’s Arctic Outlet: A History of the Hudson Bay Railway. Berkeley: University of California Press, 1957, Chapter One. 72. Investigations of the “Huronian rocks” spreading northward from The Pas had been made in 1896 and 1898 by J. B. Tyrrell and D. B. Dowling. See Canada, Geological Survey of Canada, Annual Report, Vol. 13, 1900, Part FF. 73. Between 1912 and 1918, when both the HBR and Port Nelson development projects were halted because of war-time exigency, approximately $20,000,000 had been spent on the two projects. See C. C. Norquay, “The Hudson Bay Route,” Winnipeg: unpublished University of Manitoba MA thesis, 1930, p. 35; and B. A. Frederick, “Construction of the Hudson Bay Railway: A History of the Work and the Workers, 1908–1930,” Winnipeg: unpublished University of Manitoba MA thesis, 1981, p. 32. 74. Reports from all of these publications were assiduously collected, reported and commented upon in the north’s leading—and for many years only—newspaper, the Hudson Bay Herald. See for example the 27 February, 27 March, 10 April, and 10 July 1913 issues. Major Chambers, the Gentleman Usher of the Black Rod for the Canadian Senate, provided what was essentially a compilation of pro-development government reports from the 1850s to 1913. 75. For a discussion of both the reasons behind this retention and Manitoba’s battle to gain beneficial control over those resources—or a sizable annual subsidy “in lieu of lands”—see Mochoruk, Formidable Heritage, Chapters Six through Nine. 77. This was composed of swamp lands turned over to the province by the federal government after 1885 and of railway land grants that had been turned over to the province as collateral for the bonds of railway companies that eventually failed. See Ibid., pp. 124-125. 78. They were, respectively, Conservative, Liberal, and United Farmers of Manitoba. 79. See for example the coverage of Bracken’s campaign speeches in The Pas Herald and Mining News, 1 September and 6 October 1922. Also see his later comments in, Industrial Development Board of Manitoba, Annual Report, 1 May 1925 to 30 April 1926. Winnipeg: The Board, 1926. 80. These convoluted negotiations are covered in Mochoruk, Formidable Heritage, Chapters Seven and Eight. 81. Ibid., pp. 320-322 and 333-334. 82. And this actually came to pass in two quite distinct periods: first, in the heady days of 1912–1915 when the HBR was first under construction, when The Pas was booming, when Port Nelson’s facilities were being constructed, and when major mineral discoveries were being made at Flin Flon, Schist Lake, Herb Lake and several other locations; and second, and even more dramatically, between 1925 and 1930 when the re-routed HBR was finally completed, when Churchill was developed as a major port, when eight mines finally came into production in “The Pas Mineral Belt” and the “Central Manitoba/Rice Lake” regions, when three new spur lines were under construction, and when resource towns like Flin Flon, Sherridon, Bissett, Pine Falls and a host of smaller resource and railway towns were being built from scratch. According to my calculations, approximately 35,000 short-term jobs were created along the resource frontier during this second round of development—although this figure also takes into account non-industrial work such as lumbering, tie-cutting, fishing and trapping. See Ibid., pp. 294-296. 83. Industrial Development Board of Manitoba, Annual Report, 1 May 1929 to 30 April 1930. Winnipeg: The Board, 1930, p. 8. 84. The remaining $9,000,000 represents the money which went to develop a host of failed mines, individual expenditures on housing in nine new resource and transportation towns and seven older resource towns—all of which expanded dramatically during this period—and expenditure on infrastructure for non-company towns. See Mochoruk, Formidable Heritage, pp. 292–296. 85. AM, MG 13 I2 Bracken Papers, Box 19, “Bracken to A. B. Hudson, November 16, 1927”; and Ibid. “Bracken to Charles Stewart, November 18, 1927. 86. Library and Archives of Canada (LAC), RG15, Vol. 1289, #631690 “Memo, E. E. Wood to Pereira, Acting Director, Timber and Grazing Division, Department of the Interior, 3 April 1929. For the extent of illegal cutting in Manitoba, see Mochoruk, Formidable Heritage Chapters Three and Five. For a first-hand account of how illegal cutting became a “game” played by all timbermen during the 1920s see, AM, MG 9 A2, Koons Papers, “Reminisences of a District Forester, 1924-1962,” pp. 1-4. 87. See AM, RG 17, C.B. Gill Papers # 39, “Unpublished Ms: Manitoba Forests, 1927.” pp. 134–135; and Ibid. File #25, p. 6. 88. This figure is derived from figures published in C.S.P.’s, 1876-1929, Annual Reports, Department of Marine and Fisheries. They are modified by reports submitted to the provincial government in the late 1920’s. See for example, AM, MG 13 I2 Bracken Papers, Box 19, #231, “Copy, J. B. Skapston, Inspector of Fisheries to R. C. Wallace, January 20, 1928. For examples of the incredible level of waste in the early commercial fishery, see Mochoruk, Formidable Heritage, p. 98. 89. H. C. Grant, The Commercial Fishery of Manitoba. Winnipeg: Economic Survey Board, 1928, p. 17; and Industrial Development Board of Manitoba, Annual Report, 1 January to 31 December 1935. Winnipeg: The Board, 1936, pp. 56–58. 90. CSP, 1885, Vol. 18, No. 6, #9 “Annual Report Fisheries, 1884—Appendix 9,” p. 298. 92. See LAC, RG 15 Vol. 1284 #604012, Part 4 “His Majesty King George V and the Manitoba Pulp and Paper Company Ltd. re: Manitoba Pulpwood Sale, June 12, 1925.” See especially Schedule C.
96. AM, MG 13 I2 Bracken Papers, Box 19 #224, “J. W. Martin, Acting Commissioner of Dominion Lands to R. C. Wallace, Commissioner of Mines, August 25, 1928”; and Ibid. J. S. DeLury, Asst. Commissioner of Mines to Premier Bracken, 14 September 1928. 98. W. L. Morton, Manitoba, p. 325, pp. 401-407 and p. 471. 99. Even in the less technologically sophisticated days of the fur trade, the resource base which underlay native culture in northern Manitoba had been seriously eroded. As early as 1820 the area extending south from Churchill and York Factory to Cedar Lake and the northern tip of Lake Winnipeg had been largely depleted of both game and fur bearing animals as a consequence of the over-trapping associated with the competitive period. Only small game and fish could be relied upon for sustenance, and these were often hard to come by during the winter months. And the same situation obtained in the area extending from Fort Alexander on Lake Winnipeg to James Bay in the north and Lake of the Woods in the south. As a result, the Chipewyan, the Woodland and Swampy Crees, and the Ojibwa of northern and central Manitoba and northwestern Ontario needed increasing supplies of food, cloth, and blankets from the HBC in order to fill the gaps in a resource base which had been severely depleted during the competitive era, and which in many localities was reduced to a small game and fishing base. See, “Native Canada, ca 1820,” in R. Cole Harris (ed.) Historical Atlas of Canada I: From the Beginning to 1800, Toronto: University of Toronto Press, 1987, plate 69. On the growing use of fish to supplement food supplies as game resources dwindled see C. Bishop, “Cultural and Biological Adaptations to Deprivation: The Northern Ojibwa Case,” in Laughin and Brady (eds.) Extinction and Survival in Human Population. New York: Columbia University Press, 1978, pp 213-214. On the overall decline in animal stocks prior to 1821 see, A. J. Ray, Indians in the Fur Trade, Toronto: University of Toronto Press, 1974, pp. 117-124. 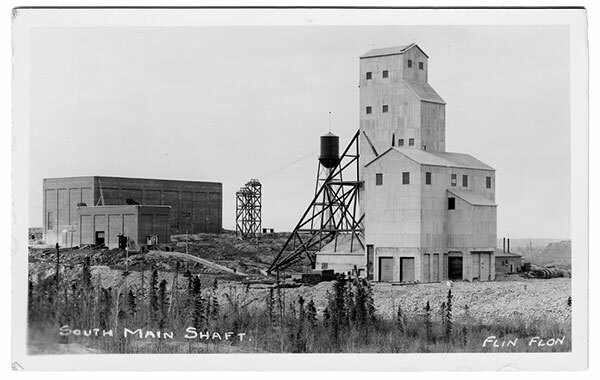 Postcard of the Flin Flon mine shaft, late 1920s.